The evidence from this period will be divided into two main areas: Neolithic African Ostrich Shells and European Megalithic art. Each of these areas provides an abundance of material for study, only a small selection shall be illustrated here. However, tables 13 (after Dolukhanov, 1979 pp.99-100, fig.26; pp.145-6, fig.41; p.149, fig.43) and 14 (after Harrison, R.J. 1980) below illustrate images found on Neolithic pottery. I have read in the course of this study, have these shells been mentioned. If Lewis-Williams and Dowson had come across this vast body of supportive evidence, I would have no doubts in suggesting that they would have used them as an illustration. Because they make no mention of them, I shall assume that they have not come across them in the course of their studies. Camps-Fabrer (1966) illustrates these shell fragments in immense detail. 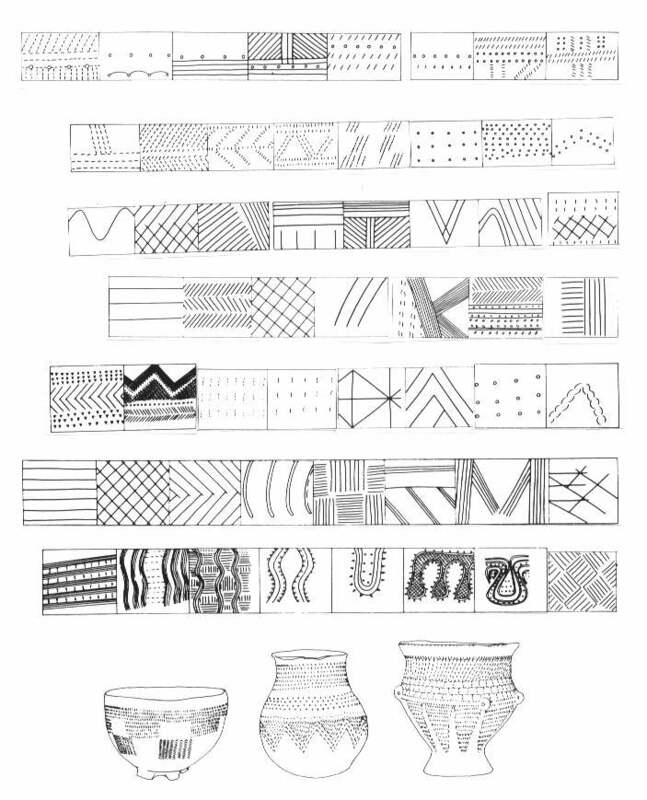 There are illustrations of 414 different sherds. I make the assumption here that the sample she has chosen to illustrate is representative of the whole body of material found across northern Africa. When this evidence is seen from the viewpoint of entoptics, it is startling. Out of the 414 sherds illustrated 66 (15%) had no engraving, save for some being neatly edged e.g. Figures 27a-g below, from El Oued, Africa (after Camps-Fabrer 1966:326 fig. 106). The remaining 348 had 427 different depictions among them. 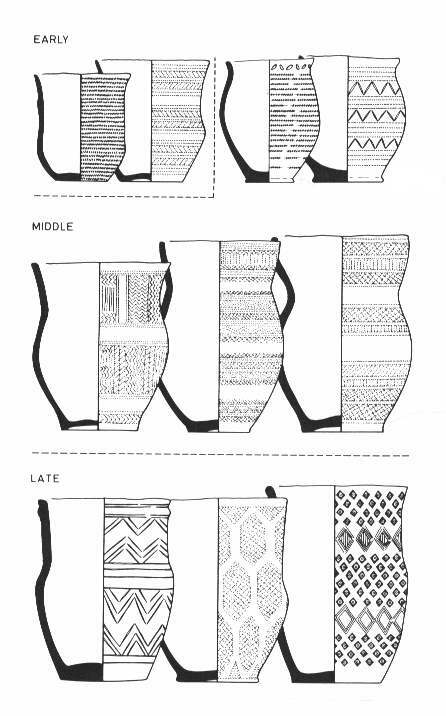 Of these remaining sherds, all engravings depicted all 6 of Lewis-Williams and Dowson's entoptic images. When making decisions as to which depiction belongs in which entoptic group, the figures can only be approximated, as each viewer may classify some symbols differently. Estimates of the amounts of each entoptic follow: Entoptic I - 101 (24% of total depictions), Entoptic II - 162 (38% of total depictions), Entoptic III - 46 (11% of total depictions), Entoptic IV - 95 (22% of total depictions), Entoptic V - 18 (4% of total depictions), and Entoptic VI - 5 (1% of total depictions). Illustrated here are 10% of each of the entoptic examples, as follow: Entoptic I - 10 depictions, Entoptic II - 16 depictions, Entoptic III - 5 depictions, Entoptic IV - 9 depictions, Entoptic V - 2 depictions, and Entoptic VI - 1 depiction. Figure 29a below, from Aïn Dokkara, Africa (after Camps-Fabrer 1966:343, fig. 114, no. 1); Figure 29b below, from Lala, Africa (after Camps-Fabrer 1966:343, fig. 114, no. 2); Figure 29c below, from Redeyef, Africa (after Camps-Fabrer 1966:350, fig. 119, no. 12); Figure 29d below, from l'Abri Clariond (after Camps-Fabrer 1966:358, fig. 123, no. 6); Figure 29e below, from Halfaza Shigha, Dar Hussein, Tunis (after Camps-Fabrer 1966:360, fig. 124, no. 11); Figures 29f and g below, from Bir Hamaïria, Africa (after Camps-Fabrer 1966:362, fig. 125, nos. 6 and 7); Figures 29h, i and j below, from Lala, Africa (after Camps-Fabrer 1966:364, fig. 126, nos. 7, 12 and 14). Figures 30a and b below, from Hamra, Africa (after Camps-Fabrer 1966:366, fig. 127, nos. 2 and 15); Figure 30c below, from Kef el-Agab, Tunis (after Camps-Fabrer 1966:372, fig. 132, no. 1); Figure 30d below, from Noiseux, Oran (after Camps-Fabrer 1966:376, fig. 134, no. 2); Figures 30e and f below, from Hanisch (after Camps-Fabrer 1966:384, fig. 139, nos. 2 and 5). Figure 30g below, from Hanisch, Africa (after Camps-Fabrer 1966:384, fig. 139, no. 9); Figure 30h below, from Oued Saïda, Oran (after Camps-Fabrer 1966:376, fig. 134, no. 6); Figure 30i below, from Hamda, Africa (after Camps-Fabrer 1966:368, fig. 128, no. 16); Figure 30j below, from Bir Hamaïria (after Camps-Fabrer 1966:362, fig. 125, no. 21); Figure 30k below, from Bir Hamaïria (after Camps-Fabrer 1966:353, fig. 121, no. 7). Figure 31a below, from El Mekta (after Camps-Fabrer 1966:360, fig. 124, no. 8); Figure 31b below, from Bir Hamaïria (after Camps-Fabrer 1966:362, fig. 125, no. 15); Figure 31c below, from Lala (after Camps-Fabrer 1966:364, fig. 126, no. 20); Figure 31d below, from Hamra (after Camps-Fabrer 1966:366, fig. 127, no. 19); Figure 31e below, from Hamda (after Camps-Fabrer 1966:368, fig. 128, no. 13); Figure 31f below, from Aïn Dokkara, Tébessa (after Camps-Fabrer 1966:369, fig 129, no. 17). Figure 31g below, from Redeyef, Africa (after Camps-Fabrer 1966:374, fig. 133, no. 9); Figures 31h and i below, from Hamra (after Camps-Fabrer 1966:366, fig. 127, nos. 13 and 14). Figure 31j below, from El Mekta (after Camps-Fabrer 1966:360, fig. 124, no. 13); Figure 31k below, from the Sahara (after Camps-Fabrer 1966:386, fig. 140, no. 3). Figure 31l below, from Hamda (after Camps-Fabrer 1966:368, fig 128, no. 10). It was the evidence from megalithic art, to which Lewis-Williams and Dowson applied their model of entoptic phenomena in 1993. They followed the work of Patton (1990) and Bradley (1989). Probably the most comprehensive study of Megalithic art was produced by Shee Twohig (1981). The evidence in this section comes predominantly from Britain, Ireland, Spain and France. Figure 32 below, (after Morris 1989:46-47, fig. 2 and 2) shows the motifs which occur in British examples of Megalithic art. The remainder of this section is devoted to some of the examples illustrated by Shee Twohig (1981). Figure 33 below left, from Luffang (after Shee Twohig 1981:fig. 139). This stone depicts a non-entoptic form, possibly one which Lewis-Williams and Dowson chose to ignore. Figure 34 below right, from Tossen Keler, Penvenan (after Shee Twohig 1981:fig. 174). Depicting a fragmented entoptic Ia and IVa. Figure 35 below, from Les Pierres Plates, Locmariaquer (after Shee Twohig 1981:fig. 146). Depicting a non-entoptic image. Figure 36 below from Ile Longue, Larmor-Baden (after Shee Twohig 1981:fig. 108). A common non-entoptic form. Figure 37 below from, Codesas, Melon, Orense (after Shee Twohig 1981:fig. 61). Depicting several forms of meander (entoptic VI). Figure 38 below, from Gavrinis, Larmor-Baden (after Shee Twohig 1981:fig. 111). Depicting the reduplication of entoptics IIa, IVa and Va. Figure 39 below, from Gavrinis, Larmor-Baden (after Lewis-Williams and Dowson 1993:58, fig. 5). Depicting reduplication of entoptic Va. Figure 40 below, from Chão Redondo 2, Talhadas, Sever do Vouga (after Shee Twohig 1981:fig. 36). Depicting entoptics IIIa and IVa. Figure 41 below, from Quiroga, Lugo (after Shee Twohig 1981:fig. 64). Depicting entoptic IVb. Figures 42, 43 and 44 below, from Loughcrew, Co. Meath (after Shee Twohig 1981:figs. 227, 229 and 228). Figure 45 below, from Clover Hill, Co. Sligo (after Shee Twohig 1981:fig. 282). Depicting non-entoptic motifs. Figures 46a and b below, from Rathkenny, Co. Meath (after Shee Twohig 1981:fig. 284). Depicting entoptic IIIa. Figures 46c and d below, from Dun Laoghaire, Co. Dublin (after Shee Twohig 1981:fig. 285). Figure 47 below, from Pola de Alande, Navia, Asturias (after Shee Twohig 1981:fig. 68). Depicting entoptics IIa and V.
Figure 48 below, from Fournocks, Co. Meath (after Shee Twohig 1981:fig. 247). Depicting entoptics IVa and IIIa. Figure 49 below, from Loughcrew, Co. Meath (after Shee Twohig 1981:fig. 235). depicting entoptic IVa. The above examples are hopefully representative of Megalithic art in relation to the subject of this dissertation. The sheer volume of the material precluded a large sample being illustrated here.